Imports .csv files that contain sets of parameter values or else creates them from scratch. Parameters are added to the MechanicalBrowserOpen panel and to parametric component properties. 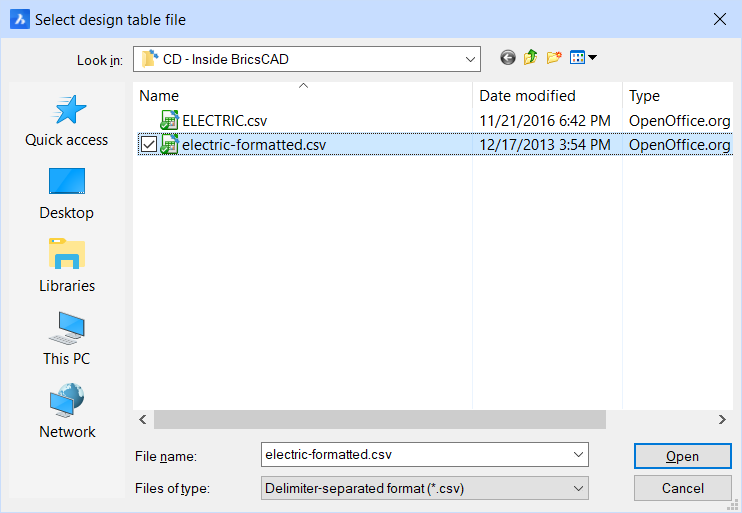 Creates a design table by importing a .csv file (comma-separated values file). Please make sure the list separator character on your system is the same as the one used in the CSV file. Enter the names of the parameters to include in the design table; press Enter after each name. Press Enter twice to stop adding names and create the design table. -DesignTableEdit - allows to edit design tables. -Parameters - manages dimensional constraint parameters in the current drawing. MechanicalBrowserOpen - opens the Mechanical Browser panel.